Originally, I had set out to make my Lost and the Damned army as one heavily based on the Traitor guard units available to the list. While it is still quite heavily guard-orientated, it has morphed into a more rounded force. The Lost and the Damned list can represent the full gamut of Chaos forces – from the Deamon riddled forces of Daemon Worlds to the recently turned forces like those at Vraks. As part of this, for each Stigmatus Coven selected, the list can take a Traitor Guard formation – either an Armoured Company, an Artillery Battery, Rough Riders or Sentinels. I want to look at each of these formations in turn and then have a look at the way they function in the list as a whole. 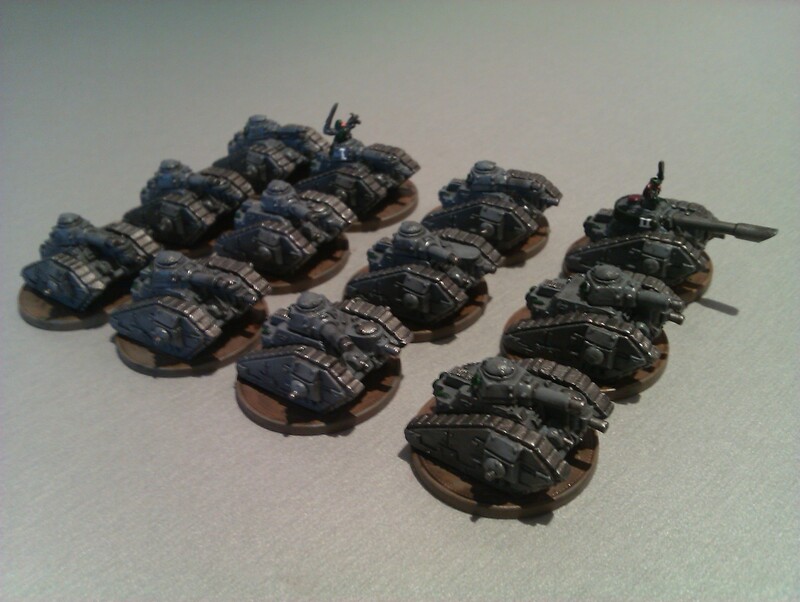 Armoured Company: For 400pts, the Armoured Company is a formation of six Leman Russ tanks (the normal kind, no variants for traitors). The stats have already been covered here, as have the various uses for the Leman Russ upgrade to regular covens. In this formation the situation is somewhat changed – the entire formation is made up of 4+ Reinforced Armour models, making it remarkably resilient. In comparison to the Imperial Guard Tank Company formation, the LatD formation is both smaller and cheaper (in practice each tank ends up costing about 66pts each). This is a double edged sword – easier to break, less firepower, lack of a Vanquisher, balanced out by more formations, less likely to be your Break Their Spirit, and the ability to spread your firepower better. Within the context of the list, the Armoured Company provides a relatively fast and resilient formation that can effectively project decent AT/AP firepower at 75cm. 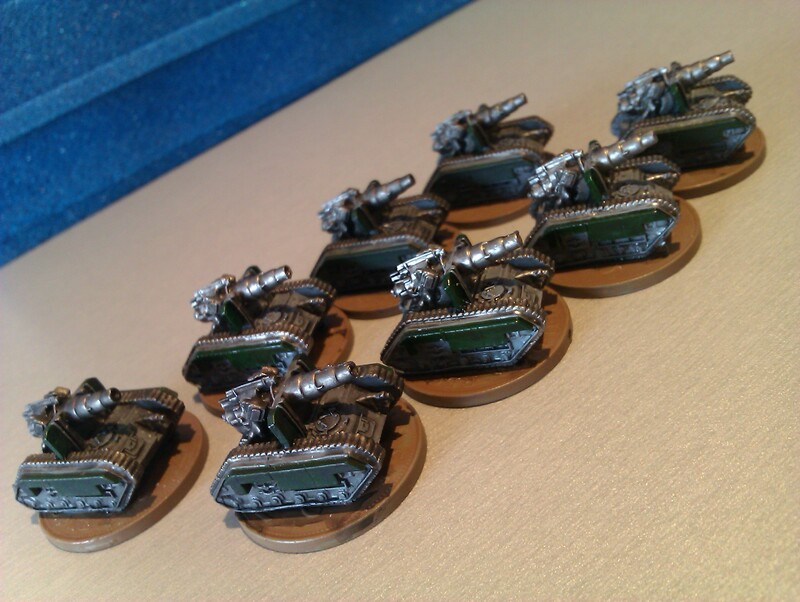 I normally take at least one, sometimes two, in a 3000pts list as it gives the infantry focused Covens some armoured support while nicely complimenting their lack of long range weaponry. 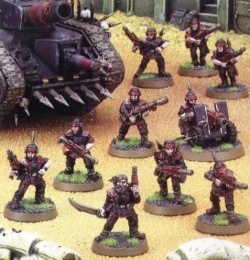 Artillery Battery: The Artillery Battery in the Lost and the Damned list bears a superficial similarity to those in the regular Imperial Guard list being made up of Basilisks with the same stats with their normal upsides and downsides. Perhaps the most important difference is that while the loyalists arrange their artillery support into batteries of three guns, the traitor batteries have four guns in each. Because of the way that the Barrage table works, 4 BP gives an extra template – doubling the potential for hits. This makes the traitor battery much better than the loyalist one, although this does come at an increased cost. In the context of the list, the Artillery Batteries function as long ranged support – forcing the enemy to spread out therefore making them more susceptible to assaults by your Covens, providing long range AT firepower, or possibly stalling assaults by putting them on overwatch. I always take at least one battery in my Lost and the Damned lists, sometimes two, when I am not taking a second Armoured Company. Rough Riders: These have to be the single most useful formation in the entire list. Combining First Strike, long charge ranges, Scouts, good CC potential and speed, Rough Rider have proven to be among the most loved (by me) and hated (by Ben from Forgot My Tea) formations in the entire list. 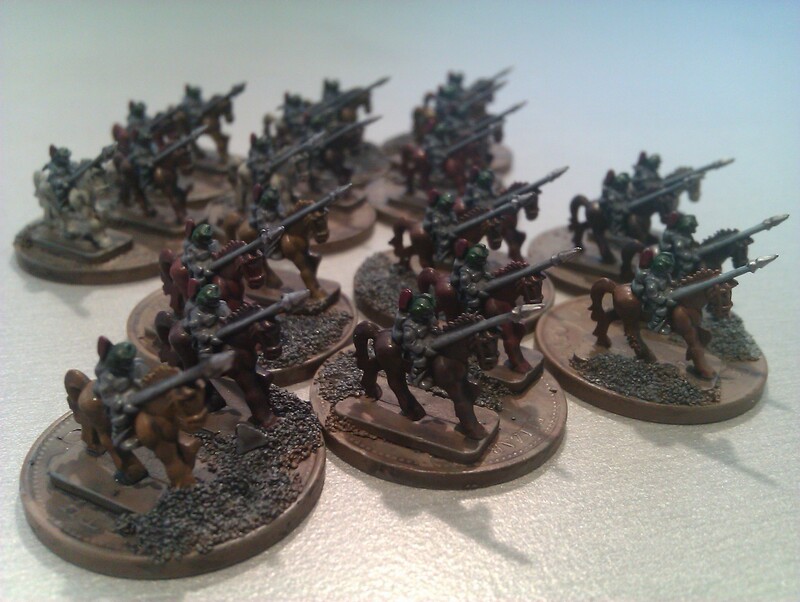 For 150pts, you get six stands of Rough Riders (same stats as in the regular Imperial Guard) although they have no access to a Commissar which is a bit of a blow. Still they are just about the only place in the list in which to get Scout, which allows them to act as screens for your artillery or for your big Coven formations, while the combo of First Strike and decent CC values mean they are a threat to most things. 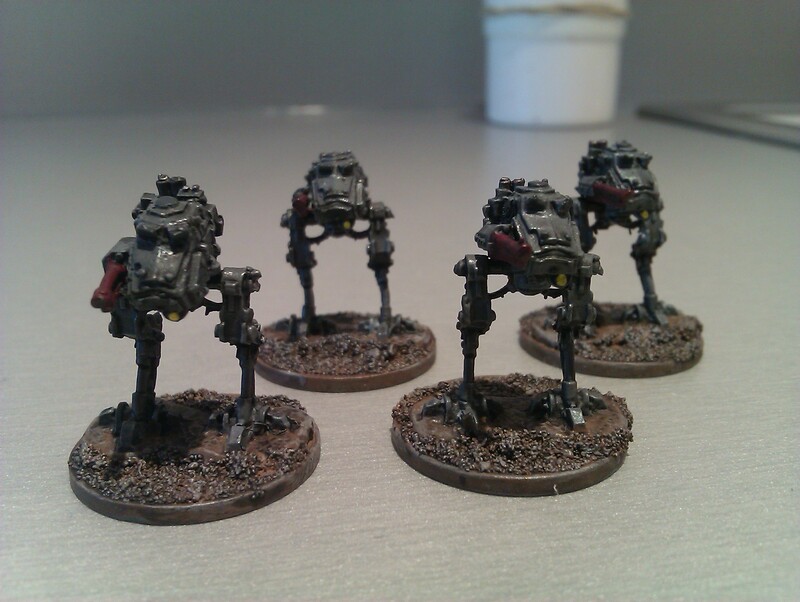 I often use them as fairly sacrificial formations – launch them at something that is likely to kill them, but that they can do a couple of points of damage to first – targeting things that would normally cause the Lost and the Damned list fits like Revenant or Warhound Titans. Sentinels: At 100pts for four, the Sentinel formation is the cheapest available in the list (remember what I said here about the 1:1 Coven to Support ratio and formation prices), and maps exactly onto the regular loyalist formation. Sentinels unfortunately pale in comparison to Rough Riders (maybe I am biased…) being less resilient, fewer in number, less capable in CC, lacking First Strike. All of these do not really make up for the 50pt saving, but Sentinels do shine in filling up the last 100pts in a list, or acting as a cheaper screen for some static artillery. Still, if you want a formation that can actually do something, I would avoid them. Overall, the Traitor Guard formations provide the Lost and the Damned list with a lot of the ‘essentials’ when it comes to list building. By this, I mean things like Scout screens, long range firepower, and BP template weapons. This is one of the things that gets talked / bitched about quite a lot with the list when it comes to development, but isn’t something I really have an issue with.